Social media marketing, using Facebook, Twitter, Google+, FourSquare, Stumbleupon (and there is a very long list) isn’t a quick fix for anything. Social media marketing, except in very, VERY rare cases, does not deliver significant results quickly. It’s not a magic bullet, but social media can deliver a powerful ROI and compliment your other marketing efforts when done correctly and effectively long-term. 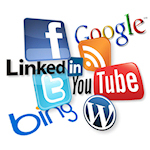 You can find more about about Social Media Marketing for small businesses here.